While a long, narrow swath of the United States was treated to a total solar eclipse on Monday (Aug. 21), several different spacecraft captured views of a partially blocked sun. Monday's eclipse was the most anticipated skywatching event in decades. The 70-mile-wide (113 kilometers) "path of totality" ran through 14 states, from Oregon to South Carolina, marking the first time since 1918 that a total solar eclipse had gone coast to coast across the entire U.S. mainland. And no total solar eclipse had been visible from any part of the contiguous 48 states since 1979. 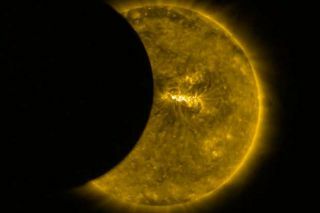 Weather permitting, everyone in North America outside the path of totality saw a partial solar eclipse Monday, as did observers in Central America, the Caribbean, northern South America, and parts of western Africa and Europe. And everyone with an Internet connection had the chance to see totality, thanks to a variety of live webcasts. Many people tuned in; Monday's eclipse shattered NASA's web-traffic record, agency officials said.